For those of you who love the city and its people, you’ll want to catch Chicago! an exhibition opening Saturday, January 25th at ZIA Gallery. Writer/photographer Bob Rehak is exhibiting original photographs from his recently released book Uptown: Portrait of a Chicago Neighborhood in the Mid-1970s published by Chicago’s Books Press. The humanistic portraits in his street photography convey a deep sense of the individual. Photorealist Alex Devereux’s works capture a play of light in dark, mood-filled reflections on Americana. Mark McMahon, of the well-known family of artists, is widely enjoyed for his colorful and lively depictions of iconic Chicago locations, festivals and sports venues. Michael Bond is noted for his fine, classic etchings and aquatints including those of the city and vintage Wrigley Field. Ted Glasoe studies Chicago’s ever-changing Lake Michigan and abstractions of architecture. Jeff Lewis is making his mark with large-scale, black and white photography of the city, especially at night. John Vlahakis brings attention to nature that exists in your own backyard. For the second year in a row, photographer Jamie Link has been honored by the City of Chicago as “Artist of the Year.” His enthusiasm for the city is contagious. Roland Kulla is fascinated with the structure of bridges. His large, highly detailed paintings present an often, overlooked view of his subject. Represented by the attached image are works by 3 Gallery Artists and 6 Invited Artists. Top Row: Bob Rehak’s Praying Man, photography; Alex Devereux’s Clark St., acrylic on canvas; Mark McMahon’s Art Institute of Chicago, original watercolor and graphite on paper; Michael Bond’s Downtown Shadows Chicago, original etching. Middle Row: Ted Glasoe’s Breakwater View, photography; Jeff Lewis’ Chicago River, large format photography; John Vlahakis’ Skokie Lagoons, photography. Bottom Row: Jamie Link’s Hurricane Sandy Halloween Sunset in Chicago, large format photography; Roland Kulla’s Lake Shore Drive, acrylic on canvas. 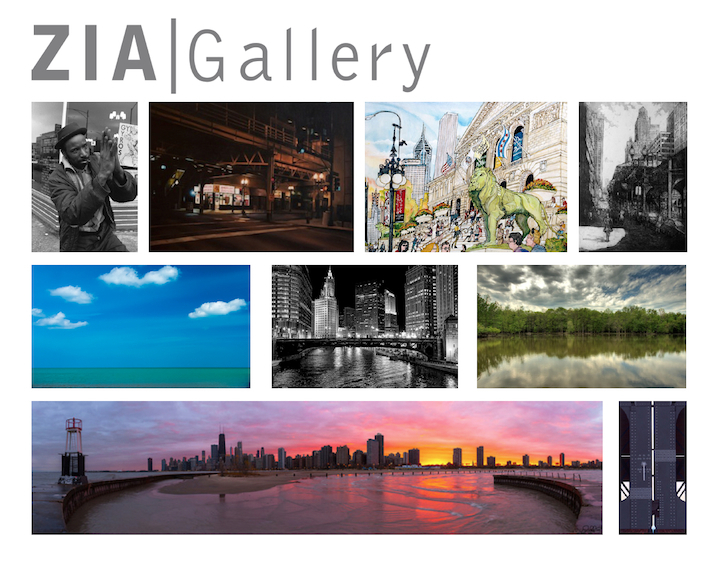 ZIA Gallery is located 2 short blocks from the Winnetka Metra Station. This entry was posted in Openings and Events and tagged art, Arts, Chicago, ZIA Gallery. Bookmark the permalink.